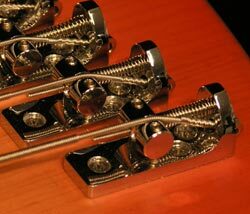 Individual bridges counteract the "crosstalk" between strings, increasing the clarity and note definition of any instrument. They are especially suited for multi-scale design as they can accommodate any number of strings, and scale lengths, and right or left handed stringing. Sold in sets for convenience, we can also accommodate the builder who has unique requirements for multi-string instruments. We also have discounted bulk packaging for larger shops, please advise us of your needs.